Be inspired by three powerful Bible stories! In The Book of Esther, a young queen must convince her husband to spare her people. 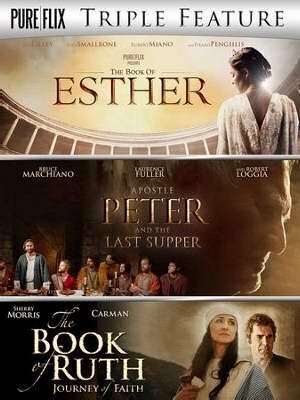 In Apostle Peter and the Last Supper, one man makes an unforgettable impression on his jailers. And in The Book of Ruth, a widow's loyalty sets the stage for the Messiah. Dove approved (12+). Approx. 4.5 hours total.